Internet’s oldest directory shows its gratitude to loyal members with unlimited discounts and outstanding product giveaway. What better product with which to recognize their good taste and reward their loyalty than a Mac Book Pro? This Apple computer is smart, stylish and technologically advanced, just like our users. How does "the Internet’s oldest directory" show its appreciation for the continued support of its members? During the month of May, Best of the Web is conducting its second annual members-only promotional campaign, offering its users a 10% discount on an unlimited number of new directory listings and the chance to win a new 17-inch Apple Mac Book Pro. Best of the Web is a comprehensive Internet directory that enhances the online experience for the end user by categorizing content-rich, well designed websites. To rank among the Best of the Web, a site must be submitted for editorial consideration and shown to adhere to strict Best of the Web criteria. Sites must contain substantive unique content, navigate in a user-friendly manner, contain no broken links or images, be up and running 24/7, and conform to universally accepted web standards. In this way, quality sites are added to the directory on a daily basis and listed in relevant categories that run the gamut of the alphabet from the Arts to Zoology. During May, Best of the Web is offering a 10% discount on all new directory submissions. Users can select whether to take their discount off the one-time site review fee of $149.95 or the annual review fee of $49.95. To qualify for the special promotion, users simply submit a site and input the code WINMAC during step two of the submission process and are automatically entered to win an Apple Mac Book Pro. Each new submission made using the WINMAC code will enter a user to win the MacBook, and users can input the code for an unlimited number of submissions during May. On Friday, June 2, Best of the Web will randomly select one listing submitted using the promotional code. The winner will be announced on Friday afternoon, and the result posted at Best of the Web's corporate blog, the BOTW Blog. Users can submit their directory listings and increase their chances to win a MacBook at http://botw.org/submit/. “The Internet’s oldest directory,” Best of the Web got its start in 1994 by empowering the burgeoning online community to nominate and vote for best-of-class websites in a variety of categories. As the Internet grew in popularity, Best of the Web evolved into a comprehensive directory categorizing content-rich, well designed websites. Today, whether the topic at hand is choosing a college, refinancing a mortgage or planning a party, botw.org gives meaningful guidance to many an Internet user. Best of the Web recently launched its newest offering, a guide to the best in the world of blogs, the Best of the Web Blog Directory. 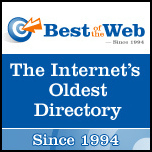 For more information on the Internet’s oldest directory, visit botw.org.